Whenever you are planning a big gala event, wedding, or other such function, it is essential that you do not underestimate the importance of hiring audiovisual equipment that is good quality. This is because the quality of the audiovisual equipment you use really can make or break your event, and can have a massive impact on the overall experience of your guests and performers. 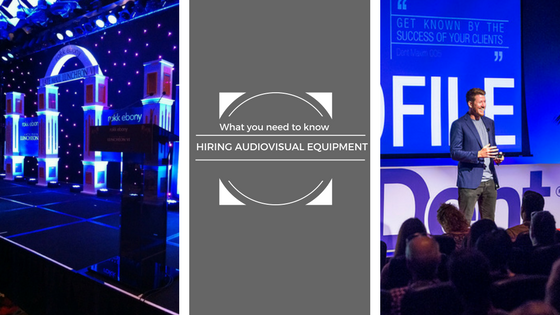 Here are a few important things which you should keep in mind when hiring audio visual equipment, to ensure that your next event goes off without a hitch. Audio visual equipment – when used incorrectly – can be dangerous. Problems can also arise when dealing with equipment that has been poorly maintained or stored for a long period of time. That’s why when hiring audio visual equipment you will want to ensure it is in good condition and that the team which you are hiring from understand the importance of health and safety. The best audio visual equipment providers should be knowledgeable about OH&S requirements and the various nuances of the equipment they are using. If this is not the case, it may be worth looking elsewhere. When hiring audio visual equipment you will want to take care to ensure that the supplier is willing to work with you, rather than for you, to meet your needs. They should be flexible and open to your viewpoints, not overly controlling or demanding. Furthermore, they should be aiming to work to your vision rather than their own at all times. There are many aspects which go into providing a good audio visual equipment hire service, but one of the absolute most important is experience and know-how. You will want to make sure that the people you are hiring your equipment from understand both the technology that they are using and the local area that they are operating within. This experience will mean that they have a familiarity with the various requirements of individual venues in the region. Furthermore, they will have connections and contacts to call on should something go wrong. Pro Light & Sound have been working in the AV Industry in Melbourne and around Australia for over 20 years. If you are looking for a company that will not just supply you quality equipment but will support you throughout your event get in touch with a Pro Light & Sound expert today!